Speed ​​Demon BMX Racing brings you the funniest bike races you' ve ever seen. You will have to select your character, being able to choose between a boy, a girl or a robot. There will be several of each style but in principle you only have one of each, the others will have to be unlocked little by little. With the same thing happens with bicycles, you will start with the most basic one and with the money that you will get in the races you will have to unlock the following ones. You will face two more opponents and you will have to try to reach the finish line in first position to get more money to use in improvements. 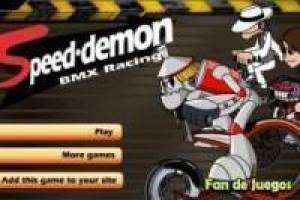 Beat each race and beat all levels of the Speed ​​Demon BMX Racing game. Enjoy the game Bmx racing speed demon, it's free, it's one of our bikes games we've selected.